HOW DO I START MY DIVORCE? The first step to beginning the divorce process is to file the following forms with the family court: Petition for Dissolution of Marriage, Summons, Declaration Under Uniform Child Custody Jurisdiction and Enforcement Act (UCCJEA) (if you have minor children together), and any relevant local forms depending upon what your county requires. For example, Orange County requires a Family Law Notice Re Related Cases to be included with all divorce filings. You can hire a professional process server to personally serve your spouse with the divorce papers. You can ask a third party, over the age of 18 (preferably not your children), to personally serve your spouse with the divorce papers. If your spouse is agreeable, you can serve your spouse via U.S. Mail. In that case, you will need to have your spouse sign and return a Notice and Acknowledgment of Receipt. If you have hired an attorney to help you through this process, your attorney will be able to arrange to have your spouse served with the required divorce papers. With all the methods of service listed above, you or your attorney will also have to file a Proof of Service of Summons to prove that your spouse has properly received a copy of the divorce papers. Divorces in California have a 6 month waiting period, and the clock begins running when your spouse has been served with the Summons and Petition for Dissolution of Marriage (and any other relevant documents). Once your spouse has been served with the divorce papers, he/she will have 30 days to file a Response and serve you with a copy of that Response. In order to proceed with your divorce, you will also need to prepare your Preliminary Declaration of Disclosure (PDD). If you have a need for child custody, visitation, child support, spousal support (alimony), and attorneys’ fees orders pending the finalization of your divorce, you can file a Request for Order to obtain a temporary order. 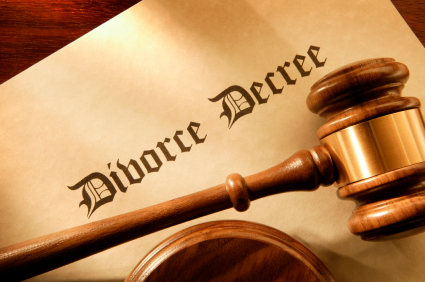 I HAVE JUST BEEN SERVED WITH DIVORCE PAPERS, NOW WHAT? If you have just been served with divorce papers, including the Petition for Dissolution of Marriage, you have 30 days to file a Response, Declaration Under Uniform Child Custody Jurisdiction and Enforcement Act (UCCJEA) (if you have minor children together), and any relevant local forms depending upon what your county requires to obtain a divorce, with the Court and serve a copy of your responsive documents on your spouse. You can serve a copy of your responsive divorce documents by mailing them to your spouse. You will then need to file a Proof of Service by Mail with the Court. If you have an attorney representing you in this matter, your attorney can handle the filing and service of all the required responsive divorce papers. Alternatively, some couples may decide to have a trial separation in order to decide whether they want to reconcile or terminate their marriage. Legal separation allows married people to live separate and apart, without being divorced. If filed properly, a legal separation will memorialize certain elements of a divorce case including, but not limited to, the dates of separation, rights and obligations regarding assets, debts, and support, etc. At Farkhad & Wang, we counsel and advise our clients as to whether or not this is an appropriate step for them to pursue.